I had never heard of Glennon Doyle Melton before being approached to be a part of this tour. Before agreeing, I did a little research, including visiting Glennon's blog, Momastery. I like what she has to say. I like what she represents. She seems like a smart and witty woman who is all about empowering women and respecting--and supporting--each other. And so, I agreed to read and review her book. I immediately liked Glennon, from her openness about her life with all its hardships to her positive attitude. She fell into addiction at a young age, as well as an eating disorder. She never felt like she fit in and found a hollow comfort in controlling what went in and came out of her body. It wasn't until she became pregnant by a man she barely knew that she realized she needed to get her life together. It was a difficult struggle, but with the help and support of her family, especially her sister, Glennon made it happen. I couldn't help but think of my graduate school research partner as I read Glennon's story. Her own experience was similar in terms of her addiction and lifestyle choices early in her life. And like Glennon, she made the decision to turn her life around and is now an inspiration to others. One day at the park, Glennon writes that she was talking with another mother and grew tired of the usual superficial banter. She spilled her story to this woman she didn't know all that well and was met with tears and a heartfelt story from this new friend. The woman could have had a completely different reaction, of course, but her own openness spurred Glennon on. Glennon knew she had to continue what she started and so she has--both in her personal life and in starting her blog. She let down her guard, let people see who she really was and not just what she wanted them to see. I recently tried to recreate a similar moment with the mother of one of my daughter's friends and was met with a quick change of subject. I didn't exactly give her my whole history--just shared a personal struggle I'd had that fit in with the conversation. It was something, and even though it may not have led to a best friend forever scenario (I didn't expect it would anyway), I am glad I spoke up. In actuality, I have been more open and honest about quite a few things over the last year and a half--talking about how hard (and funny) parenting can be and the like--and it has been very rewarding in terms of getting other women to talk about some of their struggles. While time and experience is its own confidence builder, I also feel these conversations have given me a bit more confidence, especially in my parenting choices which aren't always in alignment with what everyone else I know is doing. So, I can relate to Glennon's approach. The book is essentially a series of essays (many of which have appeared on her blog at one time or another). Glennon's writing style is conversational, and she comes across as someone who is easy to relate to. At least I found her so. There were times I wish she'd delved a little deeper, taken it a little farther. Ultimately, though, the author describes her experiences, her decision to be more truthful in her life, her family life and her love for her children. She talks about her faith and her strong friendships. She explains that she wants people to be more open with each other, more honest, and to be open to each other. She wants people, especially women, to stop competing with each other, to see how we are similar and value and accept each others differences--and most of all, to be kind to ourselves, to forgive ourselves when we falter or make mistakes. As I read Glennon's thoughts and story, I felt just the way I'm sure she hoped I would feel. Validated. Hopeful. Inspired. How long will these feelings last? I don't know. But while I was reading, it sure felt nice. I was touched by her experiences, could relate to much of what she said, and admire her all the more for who she is, what she has done and what she strives to do. She isn't perfect, and I like that about her too. Perhaps most of all. There will be some who won't connect with Glennon, I imagine. She had to make some hard choices in her life and has beliefs that might not gel with everyone else's. Even so, I think her message is one that encompasses all of us out there. 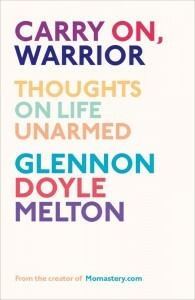 To learn more about Glennon Doyle Melton and her book, please visit the author's website. I hope you will check out what others had to say about Carry On, Warrior on the TLC Book Tours route! Many thanks to the TLC Book Tours for the opportunity to be a part of this book tour. Copy of Carry On Warrior provided by publisher in e-book form. This does sound really interesting. I like essay collections because they're easy to dip in and out of. Kathy - I agree, Kathy! They are like little snacks. I have chosen to be more open about my life in the last year, and have been met with all kinds of reactions. Some good, some not so good. But it's nice to feel like you are not hiding anymore, and even if the person who you are open with doesn't receive your openness with acceptance, you are being true to yourself, and that's all that matters. I think this would be a great book for me, and I would love the chance to read it. I am going to be looking for it. Thanks, as always for your candid review on this one, and for sharing a bit about your own struggles. Heather - It's always been hard for me to open myself to others, although I admit much easier in writing. I really liked the author's positive attitude. This is definitely a feel good book. Sounds like an inspirational read. Many thanks for the link to Glennon's blog as well as your informative review. Tracy - It definitely is inspirational! Wendy, thank you so much for your lovely, candid review. I, too, have been met with mixed reactions at times when I've let down my guard, but I think it's important to be real with people if you want to ever get past the superficialness of life. Thanks so much for being on the tour; I'm really glad you enjoyed the book! Lisa - I am glad you introduced me to Glennon's book and her blog. :-) I get tired of the superficialness--and I really do appreciate realness in people. I think life would be easier if everyone were more open with each other, willing to share the good, the bad and the ugly. I think, too, it's important for all of us to be open to that realness. Be supportive of each other. I've spent some time on Glennon's blog and found it to be an uplifting place. I am hoping to read her book at some point - thanks for the review! I agree! Glennon's writing is very uplifting. I think you will enjoy her book when you read it! I need to check out her blog. I like people who are NOT perfect..sounds like one I would like to read! Staci - Me too! No one is perfect, no matter how hard he or she may try to be.